As one of the key elements of the College, the distinguishing feature of the Pastoral Care program at Pacific is its basis on Christian principles. In recognition of differing developmental needs, students in the early and junior years are grouped by years whilst those in the middle and senior years are grouped vertically. From Prep the values of service, acceptance, compassion and mutual support are fostered. From a Christian perspective, and through practical involvement, students are progressively challenged to develop an understanding of issues of leadership. This includes leadership of self and of others in both small and large group contexts. Class teachers across the Foundation and Junior College and Pastoral Care teachers in the Middle and Senior College are the main sources of support for the student, providing an important link between home and school. In a planned way, student development across the spiritual, intellectual, physical, cultural and social spheres is monitored and supported on an ongoing basis by the class and Pastoral Care teacher. Students from Prep to Year 12 are also involved in Foundation Council Cup activities where each of the three houses (Bula, Mumba and Wira) compete against each other. A variety of activities provide a range of opportunities for a broad range of students with diverse talents to contribute to their house as they compete for the Sporting, Academic and Cultural House Shields. This spirited competition provides a strong sense of belonging across the college. Pastoral care teachers are key people in the implementation of the College's welfare strategies. Meaningful communication between parents/guardians, teachers and the student is vital to the success of all programs at the College. The values and standards of the College reflect and reinforce those of the Christian home. Class and Pastoral Care teachers are involved in support when students share concerns with them. When serious matters arise, the College Counsellor and/or the College Pastor may assist. Where necessary, and after discussion between parents/guardians and the school, outside support counselling services may be required. The College seeks to be a Christian community in which staff and students alike, give expression to their Christian faith. Formal worship through involvement in chapel services led by students, staff and the College chaplain will occur regularly each week. Parents and friends are always welcome to these services. Leadership and participation in more informal devotional activities occur within Pastoral Care time, which further support faith and personal development. Vertical Pastoral Care Groups are a key part of supporting young people in their growth through the middle and senior years. Students and staff are in the same care group for the whole time they are in the Middle and Senior College, which gives them opportunities to develop strong supportive relationships. This structure also gives parents the opportunity to get to know their child’s care group teacher well and have one constant point of contact through their time at the College. Family members are generally part of the same group. Students begin and end each day with Pastoral Care Group time. Students in Year 6 experience Pastoral Care from their Year 6 teachers and in Term 4, they begin to attend care group one day a week. From Year 7, students are fully integrated into the care group but still receive considerable support from their Year 7 teachers, benefitting from both horizontal and vertical care. The care group teacher becomes the main student support person from the start of Year 8. Students engage in a range of activities including group building activities, devotions and inter care group challenges. Pastoral Care Group teachers are the main carers for students across Years 8-12 and support students in their academic and social wellbeing. Building a Culture of Respect stands as a powerful reminder of the nature of relationships expected at the College. All members of the community are encouraged to be tolerant, compassionate and accepting of others. The College uses positive language to facilitate the development of a safe culture where students work together to support an environment that is peaceful and productive. Through the personal development program and through formal presentations of the Building a Culture of Respect principles, students and staff have the opportunity to develop skills to work through conflict and to grow in their interpersonal skills. These proactive programs begin in Prep and continue throughout the student’s time at the College. One of the important strategies has been to cultivate a culture of servant leadership where older students provide support to younger students. The three R’s are also encouraged: respect for others, respect for yourself and respect for the community. Students are encouraged to report all forms of harassment. These are recorded and followed through using a no blame approach that aims to develop the interpersonal skills of all persons involved. Parents are notified as these issues are worked through at school. As well as these proactive programs, Pacific also conducts an audit at the commencement of Term 2 as an additional check of the level of student safety. These results have reflected a very positive student culture and are reported to the staff and students. Electronic communication presents wonderful connections between people and for learning but can also be used inappropriately and may cause harm. The College provides parent seminars and information in the Compass newsletters about using these mediums in a productive manner. Through God’s acts of love and forgiveness to His people, the College approach to behaviour management is gospel-inspired. All matters of corrective discipline are carried out in the context of forgiveness, which allows students and staff to restore relationships. In a secure, success-oriented, empowering learning environment, the privilege to learn and teach must be vigorously encouraged and protected. In order to encourage and protect these privileges, social responsibilities must be taught and modeled. The dignity of all must be maintained. Where students are given opportunities to choose appropriate behaviours, self-discipline is promoted and self-esteem is enhanced. Effective management of student behaviour occurs in partnership with the families of the students. Students are more likely to produce responsible behaviour when home and the College agree on consistent expectations and consequences. Expectations of behaviour should be clearly and simply communicated to all members of the college community. Consequences for inappropriate behaviour should be predictable and fairly administrated. Support the underlying values of the College, including the commitment to uphold a gospel-based philosophy of love, acceptance and forgiveness. Show respect and understanding for the needs of self and others, their securities, happiness and self worth. Support the learning environment and the privileges of both students and teachers to learn and teach. Protect the health and safety of the students and others. Show respect for the College environment and the possessions of all members of the College community. Click here to download the full Building A Culture Of Respect Policy. Through Restorative Practices we seek to enhance relationships among students and between students, teachers, and parents, to nurture our sense of community at the College. The Restorative Practices philosophy, which is in keeping with the Lutheran approach to education, provides students with the opportunity to develop self-discipline and positive behaviours in a caring, supportive environment. A positive school climate, in which young people feel connected, is the best environment for learning. To enable students to be accountable for the real consequences of any wrongdoing. We believe that our approach should primarily be an educative and forgiving one. That is, the fundamental aim of our philosophy and practice should be for students to learn to be responsible for themselves and their actions and to make genuine, positive contributions to their community. A restorative approach sees conflict or wrongdoing firstly as an opportunity for students to learn about the consequences of their actions, to develop empathy with others and to seek to make amends in such a way as to strengthen the community bonds that may have been damaged. Valuing both a strong sense of community and right behaviour based on sound moral principles, Pacific has high expectations of all its community members. Students are called to high standards of personal behaviour and are challenged when these expectations are not met. However, they are challenged in a way that respects them as individuals made in the image and likeness of God, to enable them to correct their behaviour and to make amends to those affected. Through developing empathy for others, students learn to become more positive, supportive and contributing members of their community. This approach involves being ‘firm, but fair’. Recognising that wrongdoing primarily causes harm to relationships and that this harm must be repaired in order to move forward. 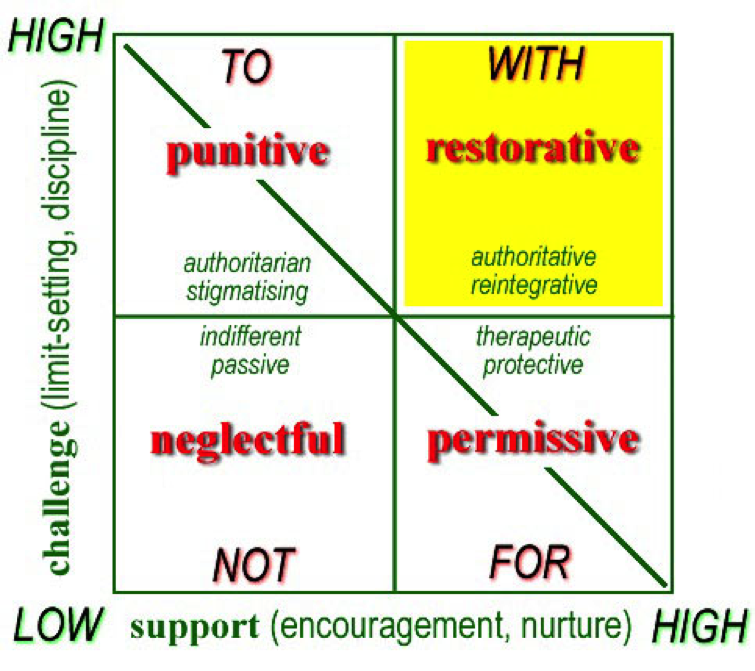 At the heart of the Restorative Practices philosophy is an understanding of the social discipline window which depicts the possible ways in which teachers (or parents) could respond to undesirable behaviours in young people. In a primarily punitive response, the wrongdoer is held to high standards, but without the support necessary for him to reach them. Such a response can be alienating and stigmatising. It can also fail to effect any real change in behaviour. In a more permissive response, the wrongdoer may find the support he needs without being held to account for his actions. It is the aim of the restorative approach to be operating in the top right pane of the window - holding students to high standards of behaviour while at the same time, providing the support and encouragement necessary for them to meet these expectations. The restorative approach emphasises working with students to educate them to right behaviour. In this way, a restorative approach is perceived as being authoritative, rather than authoritarian. An authoritative approach holds tenaciously to the community values and challenges members to demonstrate these values in all their interactions with others. In our Lutheran tradition, our primary aim in working with students is the development of self-discipline. A major focus of Restorative Practices is the development of this self-discipline through acknowledging the consequences of one's actions and then making amends. A restorative approach values the person while challenging negative behaviour. The restorative approach also reflects the central value our Lutheran community places on relationships among students and between teachers and students. Where we have confidence an issue has been resolved, the College will undertake a series of followups over an extended time. Fostering leadership skills in students is a key focus of Pacific Lutheran College. Students have the opportunity to develop these skills through formal elected positions and by voluntary membership of committees as well as through participation in a broad range of co-curricular activities. In Year 5, all students have the opportunity to act as leaders for a term. These students lead Junior College assemblies and are buddies for Prep students. From Year 6, there is a progressive opening of opportunities through participation in the peer mediation program, participation as student leaders in running activities for younger year levels, participation in the Pacific Action Groups and election as Middle and Senior College Captains, House Captains and Vice Captains.